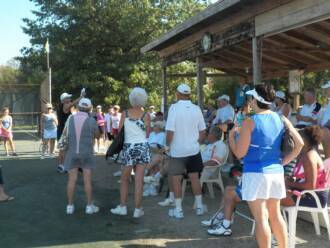 Our Annual Mixed Doubles Round Robin Tournament was a huge success thanks to the hard work of Pete & Myra Mitchell. We were blessed with another spectacular weather day as well. We had a full complement of 40 players, with some late-comers having to go onto the stand-by list. Pete did an exceptional job on the rotation, and we know he spent hours and hours figuring the matches to avoid duplications. Thanks Pete! The food was fantastic. Thanks go to Lynn Boudon, Sherri Chavez, Judy Kaminski, Myra Mitchell and Rhonda Mzik for putting together a wonderful assortment of refreshments to sustain us throughout the tournament. We played five rounds with everyone getting to sit out and rest for one of them. Next year remember to sign up early so you don't get shut out. It was a great event. I will be posting photos on the web site later this week. Last but not least … the Prizes. Congratulations to winners! For the men, Barry Yasuda took first place. Allen Porter and Bill Steiss tied for second and Dennis Sakach and Steve Chavez tied for third. For the women, Paulette Sakach, Sherri Chavez and Leslee Kosempa tied for first place. Gael Dunn took second and Karen Roggenburk took third. Honorable mention went to Jim Mzik and Anne Frantz who worked hard to get the lowest scores so they would get a prize!